4am: we leave Grahamstown. I’ve never been so cold in my entire life, I’m literally shaking. Some of it may be from the excitement that’s finally kicked in though. 7pm: we arrive in Paarl. It must have been that 3.5 hour stop at the Cango Caves that made us take so long to get here. It’s still light though, and we manage to locate a McDonalds before getting lost trying to find our accommodation: Berg River Resort. 8.30am: we leave our room and proceed up the driveway of Berg River Resort. Looking back, we see what looks like the back of a stage in the distance. Yes, we’re staying on the property adjacent to where the concert is taking place. 9am: we arrive at the venue to make sure we know how to find it. We see the stage from behind, it’s a large grey structure, covered in case of rain, which is likely. We’re told that people will start arriving to queue from 10am, but most won’t arrive till about 4pm, when the gates open. The concert is due to start at 8pm. We leave, but don’t go back to our accommodation: I don’t want to be able to hear the soundcheck. 10am: we eat a large breakfast in town. I’m not to know that I won’t eat again till lunchtime the next day. Everyone is talking about The Killers, the excitement in the town is tangible. After breakfast we head up the mountain to Paarl Rock and the Afrikaans Taal Monument. In other words, we’re searching for high ground from which to better survey the polo field on which the concert is taking place. Our efforts are rewarded, we can see the entire field from here, photo’s are taken, and creeped thoroughly. I’m not sure how we spend the rest of the day, but soon it’s time to get ready. 2pm: I straighten my hair, get dressed, and off we go. We pass a sign saying “Big Concerts Killers Concert”. I squeal a little bit inside. 3pm: we arrive at the venue, park, and approach the field, where a small line of people has already begun to form, snaking down a hill from the field. After a while, I walk up the hill to see how long the line really is: it’s gone around the field twice already. Oh. 4.30pm: the gates open. We make haste and manage to get the third row behind the barrier of general standing, slightly to the right but still relatively central. It’s not ideal, ideal would e barrier of golden circle, but it’s good enough. It’s 34oC, the sun is baking down upon us, the lines for the portable toilets and for food are ridiculous, and anyway, I’m too scared to leave my place for fear of not getting it back. We eavesdrop on people around us, it’s really quite fun. But I’m frustrated, I just want to see the band! I am reduced to posting status on facebook abut where I am. No one comments on them. 8pm: the stage lights come on, even though the sun is only just beginning to set. The atmosphere becomes almost tense, every stands up and moves forward. The opening act eventually come on, play five songs, and then leave after the lead singer declares “you’re not here to see us” in a not-quite-joking tone. 8.30pm: I’m tired. Everyone is standing, but I need to conserve energy so I sit down right where I am. People around me start doing the same. 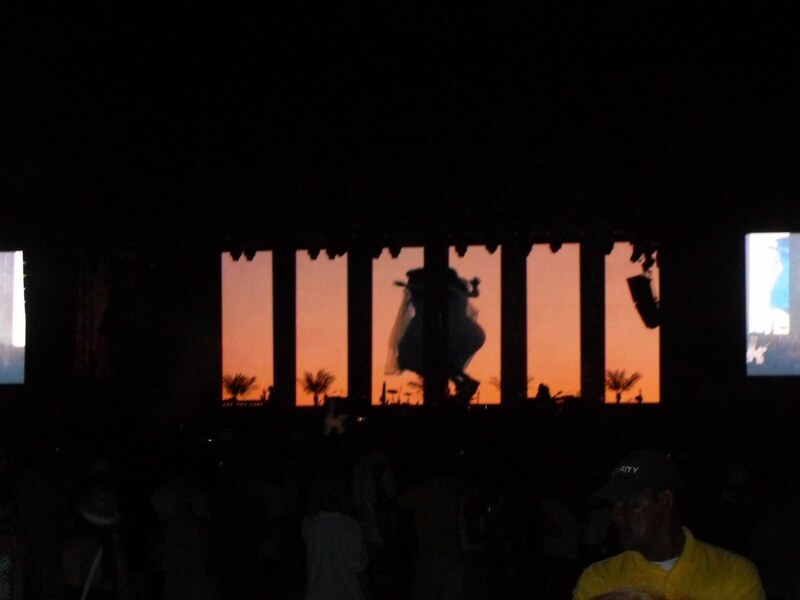 The background during "A Dustland Fairytale". I was screaming and jumping and dying, but somehow this one came out alright. 9pm: Eventually a countdown comes on the big screens which flank the stage, and we begin to hear music. I stand up. The crowd starts screaming. The first strains of “Human” can suddenly be heard, as The Killers make their way onto the stage. The crowd goes absolutely wild! Brandon starts singing, and suddenly nothing else matters. It’s perfect. Everything about their performance is perfect, polished, and professional. I scream my lungs out, jump up and down, sing and squeal for two hours straight. “Spaceman” has everyone jumping, and “A Dustland Fairytale” is likely to have reduced many in the audience to tears. After this song, I’m happy, it’s all I wanted to hear. Filled with so much beauty and emotion that it’s difficult to even describe. Brandon’s voice is flawless, and he runs around the stage with boundless energy. Even better than that, though, he’s smiling throughout the entire concert”. It’s beautiful. I hate to be one of those people who describes an event as ’life-changing’ but this one certainly was. I will never, ever, in my entire life get over that night, and there are just not enough words in the dictionary to describe what this band means to me.